Garden outdoor hanging lanterns include electrical, solar and candle models. Such lights offer gentle illumination and set the mood for parties and gatherings. 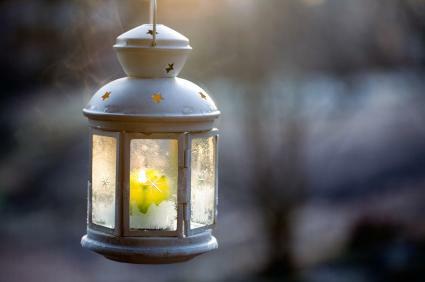 If you think of garden outdoor hanging lanterns as garden accessories, you will choose the one best suited to your garden and home style and décor. A lantern style typically includes a closed box with glass side panels and an illumination device in the middle. Such lanterns derive their look from old-fashioned, practical lanterns used to light the way by coachmen of yesteryear. The glass panels surrounding the interior light kept candles and oil lamps lit during battles with the elements and lit the way for people over the centuries. 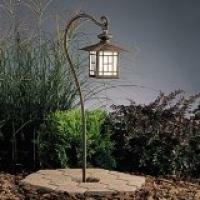 Today, homeowners use such lights as garden accents rather than for practical illumination. Most produce insufficient light for safety or security, and instead should be enjoyed for merely decorative effects. Electrical hanging garden lanterns resemble Christmas lights in that they usually include many smaller lanterns on a string. Such lanterns may resemble old-fashioned carriage lamps, Asian-inspired lanterns, butterfly lights or create multicolored whimsical effects. Look for sets marked specifically for garden use. Do not use indoor lights outside as the electrical components aren't build to withstand the elements. You may wish to take down the lanterns during the winter and store them inside for added protection, particularly if you live in a climate that gets snow and ice. Solar hanging garden lanterns are usually hung on a metal spike or crozier-shaped pole in the garden. Each lantern contains a solar cell on the top, so be sure to place such a lantern where sunshine hits the very top. Most major home and garden chains such as Lowe's and Home Depot sell solar garden lanterns in various styles, including hanging styles. You may also be able to affix a bracket to the side of the house, shed or garage to hang a solar garden lantern. Some outdoor hanging lamps rely on candles for illumination. The lamps are fashioned from metal with glass or heavy-duty plastic inserts. Tea light candles or small votive candles inserted into the central box provide gentle light. The glass or plastic panels keep the wind from blowing out the flames. These hanging garden lights look beautiful and make attractive accents for an evening garden party. You can find most hanging garden lights at home and garden centers nationwide. Specialty light shops may also carry hanging garden lanterns. Capitol Lighting offers dozens of unique lanterns and lights that will add style to any patio. Walmart offers many solar hanging lanterns for the garden or home. Do you have an electrical outlet near the area where you wish to hang the lights? If not, you must factor in the cost of hiring an electrician to add an outdoor outlet. If you prefer solar lights, can you place the lights so that the solar cells charge daily? Many solar cells need several uninterrupted hours of direct, bright sunlight to adequately charge. Hanging solar lanterns in the shade won't work. Do you want the lights as a permanent, season-long fixture, or just for a party? If it's only for a few special occasions, candles might provide the right look at the right price. Conversely, once you install solar lights, they'll turn on every night, regardless of whether you're home or not. With so many choices for accent lighting, it may be hard to choose garden outdoor hanging lanterns. Consider the options, compare the prices, and think about trying different styles to find the right match for your needs.